It�s true that Jefferson had his moments of wanting to withdraw into �intellectual pleasures� that �ride serene and sublime above the concerns of this mortal world,� as he told Maria Cosway: his taste for unworldly abstraction is nowhere clearer than inside Monticello�s empty dome, a stupendous and costly exercise in pure geometry, breathtakingly beautiful with its giant, Michelangelesque baseboard and the light pouring in from its round windows and central oculus, but virtually unusable because its echoes make conversation impossible, it�s unheated, and its access is steep and narrow. Even the sumptuous mahogany double doors built for symmetry opposite the dome�s entrance open only onto a jumble of rafters and attics. But usually Jefferson�s intellectual pleasures fully engage the world: for him, the increase of knowledge is meant to improve man�s condition. When Buffon �affected to consider chemistry but cookery,� for instance, and to equate the laboratory with the kitchen, Jefferson took sharp issue; chemistry, he lectured the count, is �big with future discoveries for the utility and safety of the human race.� Did not people justly esteem �Dr. Franklin�s science because he always endeavored to direct it to something useful in private life�? Were not phosphorous matches, for example, a boon to mankind, and would not interchangeable musket parts, which he saw in France long before the Colt factory used them for mass production in America, change history? 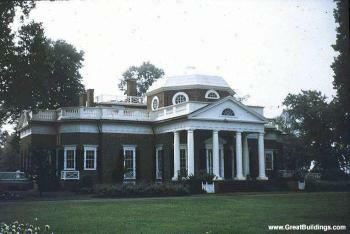 Monticello is truly great, yes. Too bad the rest of Jefferson's architecture was pretty much a failure.